These two topics are completely different, and here’s why. Loyalty, the quality of being loyal to someone or something. In our daily business routine we sometimes focus so much on loyalty, and lose sight of the income or profits. Our expenses and market strategies may not generate the bottom line profits we seek. In business, its paramount that are outlined strategies and expenses a-line with our profit margins. With that being said, I understand as a successful business, we must spend money to retain new loyal customers. But, here the tricky part, our loyal customer will come in with or without an incentive. Don’t misunderstand what I’m saying, but understand and measure those results, did my marketing piece drive in more customers’ or would the same amount having not marketed to them be the same. Analysis must be performed with everything and tracked. You can’t fix what you can’t measure. 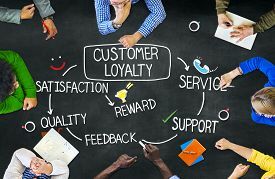 Loyalty, what drives this part of the business? It’s your front line employees they make or break the business. The surveys may not identify the root issues and only being seen on the surface. Our customer’s may come-in because of the market mailer they received, but your business may never see them again. Those are the customer’s who say nothing and never response to surveys. So, how do we stop this issue before it’s rooted. There should be a process in place, that ensures every customer leaving has a follow-up scheduled in the system. Having this process in place will ensure every customer is completely satisfied and will be returning for routine service and maintenance. I’ve found after all my years in service, and working with our service consultants has given me the tools needed for success. Loyalty, is what ensures are success and brings many referrals are way. Understanding our data base is huge. It’s not difficult, what’s difficult is not using the tools we are paying for, that’s the issue. I was told many years ago, numbers don’t lie, they only tell a story. So, spend your money wisely, and track your marketing strategies. I had put together a focus group and discussed ways of bring more customers in. You would be absolutely amazed and surprised with all the ideas coming from your staff. They understand it better than you realize. Our costs and expenses will be cut in-half just by using their ideas. So, put together a focus group, service consultant, parts person, and technician, and watch the magic happen. Make sure you put an agenda in place not to get off target, and objectives must be outlined. The team wins and most importantly your customers win.